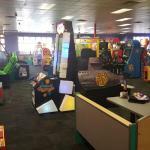 We decided to treat our grand children to a Saturday lunch at Chuck E. Cheeses. We arrived shortly after they opened so being seated quickly was not an issue. We ordered one of their specials that included many game tokens. The iced tea was old and tasted bad. The diet Pepsi was watered down and the restrooms needed attention even though they had just opened. To our surprise, the pizza was pretty good but was over priced for what you get. I would tell someone to try this experience only if you viewed it as an amusement arcade with food and not as a restaurant with games. Overall, the kids enjoyed themselves but I don't see us returning. Been to Chuck E Cheese's? Share your experiences!